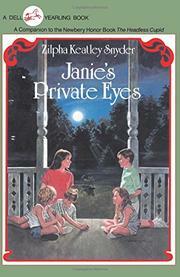 Janie Stanley involves her four siblings in her investigation of the kidnapping of several local dogs. Ever since eight-year-old Janie received a forensic chemistry set, she's been hankering to solve a mystery--the dogs' disappearance provides an opportunity. And because her parents have restricted her activities (she inadvertently broadcasted some rude remarks during their New Year's party), Jane is forced to maneuver the other Stanley children into participating. Once they learn that a Vietnamese family is being unjustly accused, Janie's brothers and sisters pitch in with a will and soon find the real criminals, thus covering themselves with glory. This fourth book about the eccentric but believable Stanleys and their madcap adventures stands well on its own, though it will be enjoyed even more by those who have read the previous three. Funny and fast-paced.